Finding a way to include chocolate in my diet is important to me. This decadent desert usually is so often catergorized in the 'unhealthy food pile' and has fallen prey to this 'bad' label. I really think people really are referring to overindulgence when they say bad though. What is a bad food anyway? There are foods which make us feel better when we eat it, nourish our bodies more, help us to grow stronger etc., but every food has its piece in the equation. Are you eating food with the best possible, quality ingredients used? For me quality weighs just as much as health value when it comes to food. It's the difference in making calories count, and just gulping whatever. If I'm eating a cookie, it damn well be the best cookie I could eat with the most natural, purest ingredients, and no preservatives. Once you see something as bad, you connect emotion to it; it’s bad, so you feel negative emotions towards it. Being aware to not label food so much, is necessary to becoming a non-dieter, because diets are fueled by catergorizing foods into ‘good’ and ‘bad’. And the end result- guilt associated with everyday eating. Like most things, chocolate has it good. It has a high antioxidant content which is beneficial to heart health, and is has been shown to have a 'happy' effect on the mind. These benefits have been most associated with dark chocolate over milk chocolate. 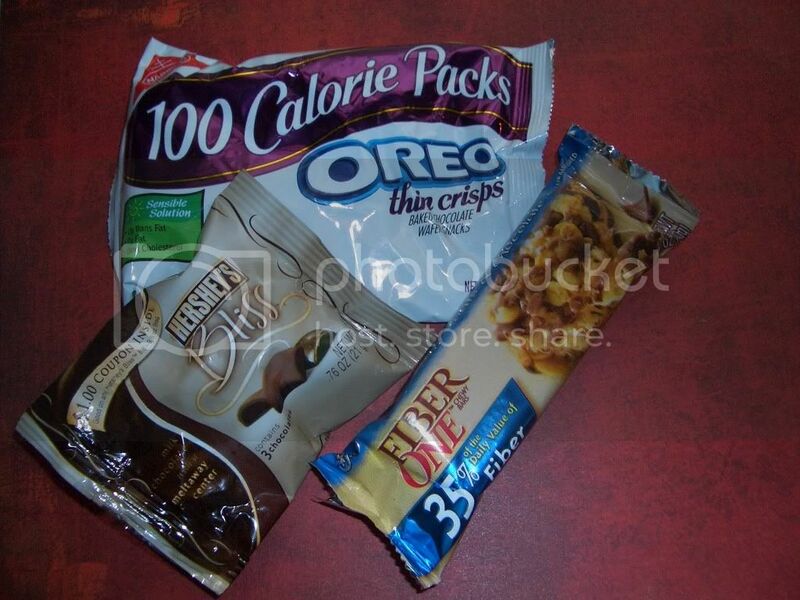 For the past few weeks I've had my chocolate fix in these ways- a 100-Calorie snack pack of Oreo Baked Chocolate Crisps, fiber One Chewy Oats & Chocolate Bars (9g Fiber/serving), and Hershey's Bliss three piece Milk Chocolate pack. The entire three piece package is still only around 100 calories. Other great chocolate, low-guilt options I've encountered recently include TGIF Friday's Dark Chocolate Cupcake Duo, which are satisfyingly 'chocolatey' and not too sweet. Plus because you get two, you can eat one and leave one for later. The Chocolate Rasberry Mini desert is on my 'wishlist'. I also like that they give you the Calorie info. on most of their desserts. Also on my wishlist is Dagoba Organic Chocolate and Trader Joes 100-Calories Chocolate Sticks. For those who are diabetic or really carb conscious there are several sugar-free chocolates on the market from companies such as Carbsmart. Total enjoyment is possible even with chocolate. Thanks for this post. I appreciate any information I can get about chocolate. This is a really good post! I believe the same things about diet and dessert! Everything good in moderation, and there are no "bad" foods!